Home to the famous brand of Komachi rice and high quality Sake, Akita is a land blessed with abundant rivers and vast expanses of flat fertile land. Representing one of Japan’s major rice farming regions, Akita boasts a wealth of delicious local cuisine and is said to be home of the legendary ‘Akita Bijin’; women who are famously beautiful for their white skin and rounded faces. A great place to start any exploration is the Oga Peninsular with its craggy rocks and spectacular views of the coastline. Along with its natural wonders this area is also home to the legendary Namahege Festival where young people dress up as scary looking Ogres in order to drive away evil spirits. Further inland, the former castle town of Kakunodate boasts one of Japan’s best preserved Samurai districts where you can get a sense of how these famous warriors used to live when walking along its unusually wide streets or seeing its unique architecture. For nature lovers Lake Tazawa is a popular vacation spot famous for its mysterious atmosphere and sapphire blue water which changes to jade green depending on the season. 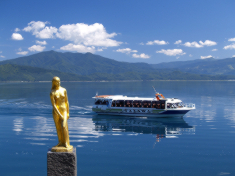 Featuring a female bronze statue on its western shore, this lake is home to many local legends. A short distance away in the secluded hills is Lake Tazawa and the beautiful Nyuto Onsen Village. Situated within the Towada-Hachimantai National Park, this village is a collection of several secluded hot springs and traditional Japanese Style Inns set within an idyllic forest setting. Any trip to Akita will soon open your eyes to the wonders that Japan’s north has to offer and perhaps install you with a sense of the frontier spirit that is a unique part of the Tohoku Region. For more information about Akita prefecture, see their official tourism website. Air - Akita prefecture by Akita airport with flights from Tokyo, Osaka and Nagoya. There are regular flights to Seoul. Click here for its English website. Rail - The Akita Bullet Train or Shinkansen runs from Tokyo to Akita with stops at Sendai and Morioka. The trip from Tokyo takes about four hours. 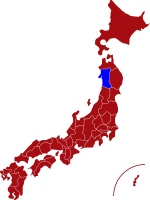 Kakunodate is a former samurai stronghold located in the southeast region of Akita City. The town has retained much of its original architecture and is considered to be one of the best examples of a traditional castle town. 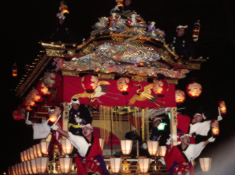 Kanto Festival is held from the 3rd to the 7th of August and dates back more than 250 years. One of the many highlights of the festival is watching performers skillfully balance 12 metre long kanto (bamboo poles) weighing more than 50kg through the streets. Nyuto Onsen is a hugely popular hot spa resort located in a secluded part of the mountains to the east of Akita city. 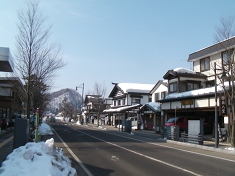 The resort consists of eight different ryokans, some dating back more than 300 years. Lake Tazawa is the deepest lake in Japan with a depth of over 400 metres. The area is blessed with many wonderful hot spa resorts making it a popular tourist destination all year round.